those that remove the solids directly from the bottom by means of suction. Here are described the scrapers. Straight plough scrapers were popular but not effective for any type of solids. Curved plough scrapers are convenient at many situations. Fixing them to the arm is relatively complicated and thus spiral scrapers took over. Variable angle spiral scrapers are popular in Europe. They are easy to assemble and less expensive than previous types. Logarithmic spiral scrapers are increasingly popular. Angle of attack is typically 30-40º. 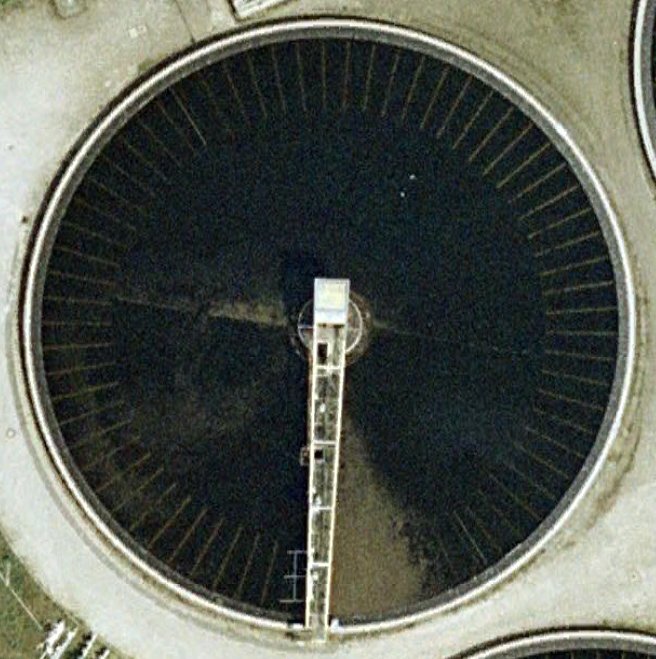 Advanced design combines full length (radius) and partial length arms to provide sufficient energy to overcome tixotropic properties of activated sludge and sufficient transport of sludge to minimize the difference between the bottom and the recycled TSS and thus the sludge blanket depth. Two-speed or variable speed arms are used as well. Some principles of new design are shown in the figure. Note: Mean interval of rotation at peripheral velocity 0.04 m/s. Industrial clarifier for periodically heavy, periodically light particles, with peripheral drive, two full and two short arms, equipped with logarithmic spiral. Single weir effluent launder mounted on the inner side of the wall; Stamford baffle. Weir loading rate was not considered to be a valid parameter for design. Large clarifier with two full logarithmic scraper arms and Stamford baffle. A single arm scraper in a large clarifier is a source of problems. Small speed of rotation causes high sludge blanket. Large speed of rotation causes loss of suspended solids into the effluent, typically behind the scraper arm. Substantial research on counter current scraping has been done before the year 2005 at ETH Zurich, Versuchsanstalt für Wasserbau Hydrologie und Glaziologie (VAW), see for instance Hollenstein. As can be seen from the figure, counter current scraping causes elevation of the sludge blanket and undesirable hydraulic pattern above the blanket. The higher the scraper blade, the more pronounced the adverse effects. Adverse effects are strengthened by locating the sludge hopper at the inflow end, see also the chapter Sludge Hoppers. The flow through one of two clarifiers was reversed. The inlet pipe was extended to the former outlet end. Cooperation of AquaNova International and Hydrotech Group. Concurrent scraping is better and costs the same money as counter current. So why to be backward?